In the field of military history as in so many others, the Chinese have often been both admired and seen as something utterly mysterious and inscrutable. Chris Peers illuminates the evolution of the military art in China with reference to ten battles, spanning more than 2,000 years, from the Battle of Mu in 1027BC to the Fall of Chung Tu in 1215 AD. Selected both for their historical importance and for the light which they shed on weapons and tactics, the author uses these examples to discuss the many myths still current in the West about ancient Chinese warfare: for example that the Chinese were an unwarlike people, always preferring subterfuge over the use of force; or that they were essentially defensive minded, relying on works such as the Great Wall. On the other hand, a recent reaction to this dismissive attitude portrays China as technologically far in advance of the West. Battles of Ancient China shows that none of these stereotypes are accurate. Comparison with contemporary Western practice is a major theme of the book which adds a new perspective not developed in the author's previous works on the subject. 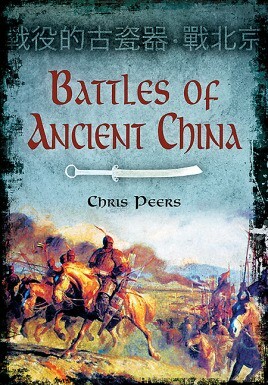 Chris Peers is a leading expert on the history of ancient and medieval warfare and has written widely on the subject. He has contributed many articles to military history, wargaming and family history magazines, and his major publications include Warlords of China: 700BC-AD1662, Warrior Peoples of East Africa, Soldiers of the Dragon, The African Wars: Warriors and Soldiers of the Colonial Campaigns, Offa and the Mercian Wars: The Rise and Fall of the First Great English Kingdom, and Genghis Khan and the Mongol War Machine.